I met Jen Fawcette almost a half year ago, and I was really inspired by her passion for cycling and her interest in trying anything once - as long as it had to do with cycling. We met at the Forest City Velodrome at a women's only clinic on the track in London. 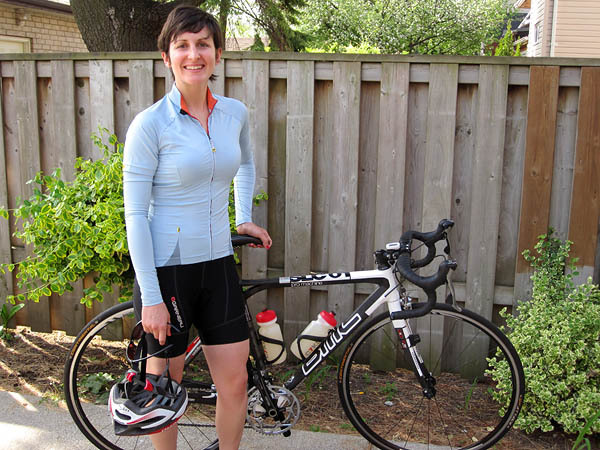 Jen is a spin instructor, an avid cyclist, a charity ride participant and has now started a women's only road riding group for Toronto cyclists - CYKLfemmes. After we had our experience at the track, she linked me up to her blog; full of cycling-related blog entries related to women's cycling, people and experiences, and I've been reading ever since. It's nice to learn why cycling has inspired other people and I think C4W readers will find Jen's passion and love for cycling inspiring as well. Her Claim to Fame: Hitting a speed bump and landing on her face, then having to walk around for a week or so with scabs that looked like an STI. Female cyclist that inspires her the most: "All the ladies I ride with here in TO inspire me." Famous cycling moment that inspires her the most: "My own - riding around the Cabot trail in the mist and fog"
C4W: You have a passion for cycling, obviously! Where does it come from? What is it about cycling that gets to you, and why do you love it so much? JF: Cycling is a lifestyle. It's how I get to work and back, it's how I workout, it's how I challenge myself mentally and physically, it's how I contribute to my community (through charity rides), it allows me to get away when I need to, it allows me to bring people together, it's what I plan my vacations around, and gives me a reason to eat lots of dessert. I have never done another sport that has fit into my life like cycling has. C4W: Your work life and personal life revolve around cycling. Tell us about your involvement with the cycling community - how many roles do you play? What is a typical week like for you? JF: My involvement in the cycling community in TO is to try, in my own little way, to support female cyclists. When I first started I found it hard to shop for women's cycling stuff. I knew nothing about bikes or the sport, which made walking into a bike shop a bit intimidating. So, two years ago when I was a newbie cyclist I started blogging about it. My blog has led me to chat with other women cyclists, explore TO's cycle shops, ride new routes in TO and beyond. I try to use my blog as an education tool for other cyclists. When I can I write ride reviews, post info on basic bike maintenance and where to shop for women's things, brands that I use and love, etc...All important things, but hard to figure out if you're new to the sport. 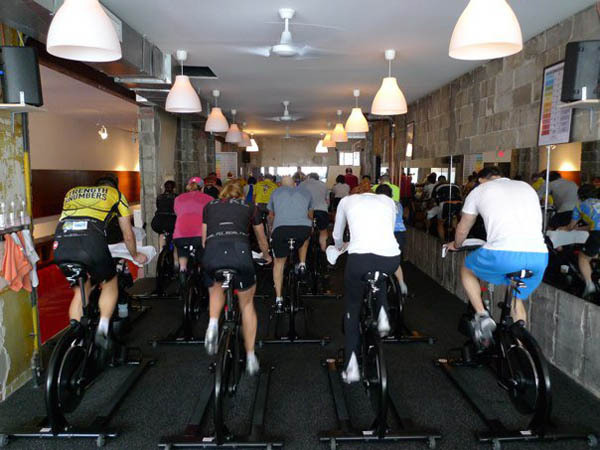 Beyond the blog, I teach three indoor cycling classes a week (spin is how I first was introduced to cycling) at CYKL. I also manage the CYKL studio. And as of May 5th will be running a women's only cycling group out of CYKL! Woot! C4W: Tell us about this new women's only road cycling group - I saw the poster. When did you start this? Your group is OCA-sanctioned (Ontario Cycling Association)? JF: The CYKLfemmes group is meant to be a causal women's road cycling group, that will start at CYKL every Wednesday evening at 6:30 pm. I love riding with guys, don't get me wrong, but sometimes it's just nice to hang with the ladies and learn from each other. It's OCA-sanctioned for insurance purposes, so it's a legit group. The group is a way to share our passion for cycling with our community. C4W: What's the future look like you - what are some of your cycling goals? What are some of your business goals? JF: More adventures on my bike! My boyfriend and I are going to France next year to test our legs on some famous climbs in the Pyrenees. It's not going to be easy, but it will be amazing! Beyond that, I want to grow CYKLfemmes into the best women's group TO has to offer. Getting more women hooked on cycling as a sport and lifestyle is one of my goals. Also I'm interested in trying my hand out at racing, maybe in the next year or two. I'll have to take a couple of skill development courses soon to do this! And career wise I want to see a couple of more CYKL studios open in TO and then across Canada. CYKL's general manager and owner (one of three owners) is a woman named Kim Donnelly. I admire and respect what she has created and believe she has a terrific vision for her indoor cycling studio. The use of the RealRyder bikes (which move below you and give you a great core workout) and her coaching style that is rooted in cycling makes for an effective and amazing workout. CYKL is taking indoor cycling to new heights.